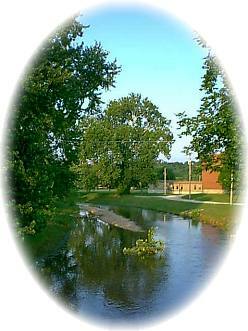 Known historically as the "Little Town on the Border," Seneca is a rural community tucked into a small pocket of southwestern Missouri in Newton County. Just across the state line are Oklahoma and the Eastern Shawnee tribal headquarters. In 1833 a group of pioneers from Ohio discovered and settled in this lush valley where the beautiful clear streams of Lost Creek and Little Lost Creek converge at the edge of Indian Territory. Lost Creek and Little Lost Creek wander through downtown Seneca, which fills to capacity during Fourth of July, Homecoming, and Christmas parades. Many century old homes and buildings and the one-room school house and caboose, as well as, several historical murals remind the town of it's proud past. Seneca's close, cooperative relations between the school, city, and business community come together during the parades, and the annual cultural events such as the Indian Country Jamboree and the Eastern Shawnee Pow Wow. The lovely Grand Lake of the Cherokees is a six mile drive away, and local citizens enjoy a low tax rate, splendid communications and transportation facilities. Seneca's friendly hometown atmosphere makes it an ideal location for industries, investments, and home-seekers. Truitt's Cave is featured in "Ripley's Believe It or Not." with the cave restaurant of yesteryear, the Underground River, Trout Reservoir, Root Canal Wall, Underground Geode, Endangered Salamanders and many rare formations. Learn of John Truitt, "Caveman of the Ozarks"